Invalid root. The WEB-INF/flex folder must contain either flex-config.xml or services-config.xml. And I was sure that the WEB-INF folder actually had the correct files under it. I tried a few different values but none of them actually worked. The solution to this problem is to go back to Step 1 and uncheck the checkbox ‘Use remote object access service’ under ‘Application Server Type’ and manually set the Flex Compiler Settings. I added this to the compiler args ‘-services “/Applications/ColdFusion9/username/………services-config.xml” – basically telling the compiler where the file is. I think this is more to do with the Flex Builder itself and how it treats different paths. 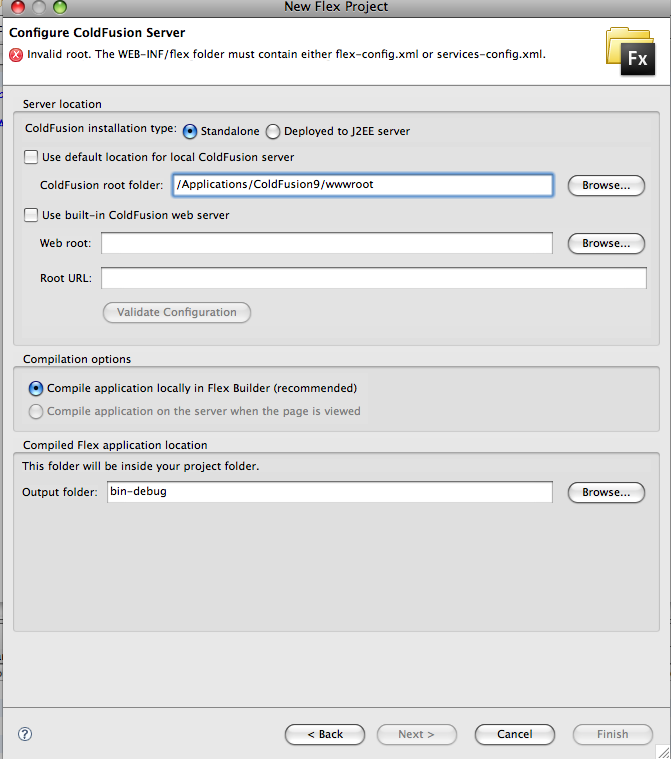 21 Responses to CF/Flex Connectivity in Flex Builder : Invalid root. The WEB-INF/flex folder must contain either flex-config.xml or services-config.xml. According to the docs, the ColdFusion Root folder is the folder that CONTAINS the wwwroot folder, not the wwwroot folder itself. I bet if you try again, and use the folder /Applications/ColdFusion9/ it will validate with no issues. “According to the docs, the ColdFusion Root folder is the folder that CONTAINS the wwwroot folder, not the wwwroot folder itself. I too had a similar issue. I am pretty sure if you try this then you will resolve the issue. You say you are pretty sure this IS what you were doing but I am pretty sure it is not. Go back and look at it and you will find it will validate no problem! Liberation می‌گه:Mr. Bamdadi:Thank you very much for the new link, but this one gives me the same message. It is OK. I will try later. I would like to say thank you for your good work. Nick, I am pretty sure thats what I was doing. It was not validating. 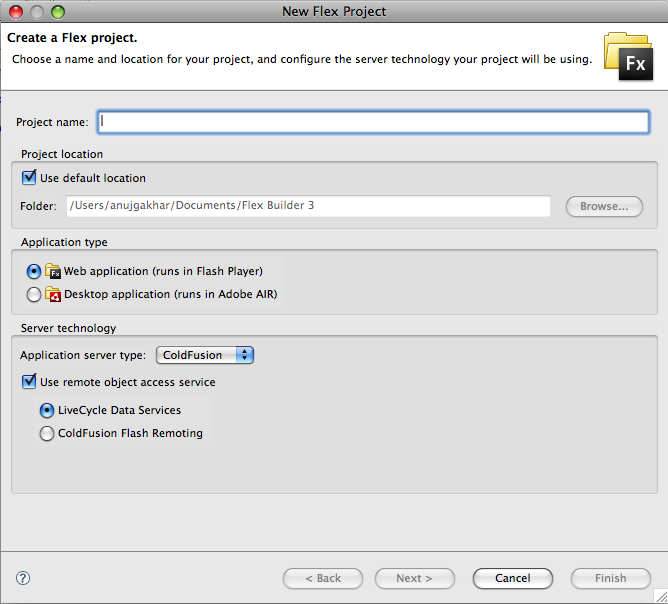 I’ve got exactly the same issue than Anui , but when migrating a flex 3 project to Flash Builder 4. Thanks heaps for the tip. This had me stumped for a while. I was totally stumped too. Thanks for the cool tip. It worked like a charm. I think it’s about the folders setup. The applications folder must have the Cold Fusion 9 folder within it, the site folder. I had a similar experience with another application. I kept installing it, but it stops at this point. It’s a minor entanglement, though. But if you can’t figure it out, you can’t have your program up and running. A very cleared demonstration, and it works well..
and no doubt when I tried to follow the steps..
Coldfusion is so complicated to me. However, It is a very clear demonstration and actually makes sense to me. I always appreciate it when something complicated can be rendered fairly simple in explanation. Thanks for the post. Mr. Anuj Gakhar, you did a great job explaining something diffucult to a newbie :-). I’m glad I find your tutorial. I wonder if someone can help me with this. I am using FlexBuilder 3. I am unable to import my project from one laptop to another. The old laptop had CF8 and the new has CF9 so I’m not sure if this is the problem. When I try to import an archive I exported from the CF8 laptop, I get the prompt to update the path variables. It accepts the path to ColdFusion9 but will not accept the web root. I have tried C:\inetpub\wwwroot but it gives error message saying ‘the selected web root folder does not exist’. I also tried C:\inetpub and C:\ColdFusion9\wwwroot. I’m stumped at this point and desperate to get this imported. I have been having a nightmare trying to migrate this application from CF8, Windows Server 2003, IIS 6 to CF9, Windows Server 2008, IIS7.5. We are also using SSL so from what I’ve read I will have to recompile all these swfs with some changed XML config files. But of course, the first step is getting the app into FlexBuilder. Thank you. It really helped me a lot. I’ve been trying to set up mine for how many days now and kept getting the same error. If not for this I wouldn’t realize that I selected the wrong root folder. How clumsy of me. You have a great site, very informative and I do love ciomng back in here, since your website is interesting, I will more some of your entries later since I gotta go right now to go to comedy club and will have fun. Anyhow, you take care always and have a wonderful day! I’m try to use CF10 and Flex 4.x I get the error. Invalid root. 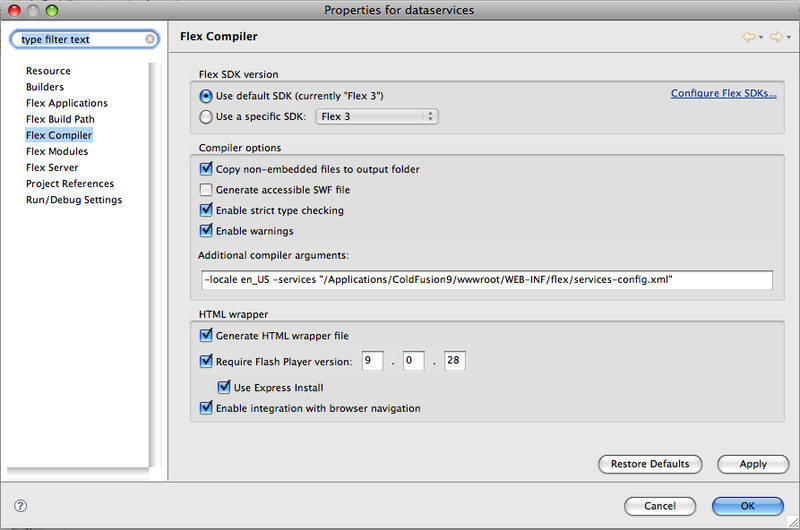 The WEB-INF/flex folder must contain either flex-config.xml or services-config.xml.